The project is located within steps of the Stadium-Armory Metro, and will serve as the gateway to the new 68-acre Hill East District waterfront neighborhood. The project is comprised of two distinct mixed-use buildings located on the north and south edges of C Street. 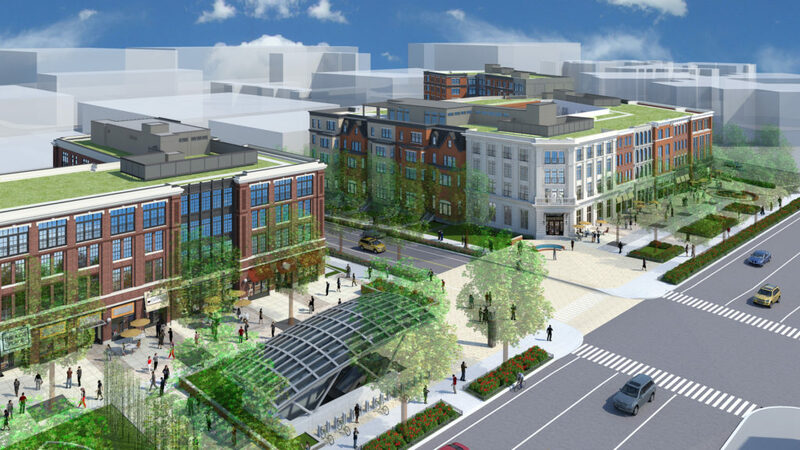 These buildings, along with the pedestrian-focused streetscape which surrounds the property, are the first steps toward creating a new, vital neighborhood center around the Metro station at C and 19th Street. The North Building includes 91 residential apartments, incorporating a mix of studios, one & two bedroom units. Additionally, over 13,000 sf of retail space will be provided at the base of the building along 19th Street, with one level of structured parking below. Building amenities will include: dynamic communal spaces which front the interior landscaped courtyard, a roof-top party room with kitchen and terrace area, business center, spacious bike storage and bike shop. The South Building includes 258 units and over 21,000 sf of retail space provided along 19th Street. Similarly, one level of structured parking will be provided below the building, with a comparable mix of studio, one, and two bedroom apartments. Building amenities will be similar to those noted for the North Building, with the addition of a second, semi-private interior courtyard for building residents and a fully equipped fitness center with an indoor/outdoor cardio room and game room. The South Building will also provide a roof-top party room and terrace which will allow views to the waterfront east of the property for building residents.